Are Bears Really A Threat To Princeton? A few bears have been sighted in Princeton in the last couple of weeks and people are going a little bear-crazy! Yesterday, in an editorial apparently taken directly from ‘The Colbert Report‘, the Princeton Packet worried about the possibility of bear attacks in Princeton and called for new protocols on whether children should be allowed to walk home alone when bears are around. Wild animals are not to be trifled with (see our recent post about angry geese), but this seems to be an over-reaction. Since 1998, just 19 people have been killed by black bears in the USA and Canada. In the same time period, at least 366 people have been killed in attacks by dogs. We could reasonably conclude that dogs are 20x as dangerous as bears. But even that pales into insignificance compared to another common killer: cars. Since 1998, approximately 58,500 pedestrians have been killed on our streets in accidents involving motorized vehicles. The total of pedestrian deaths in the USA annually exceeds the terrible toll of the 9/11 terrorist attacks. According to CDC statistics, on average a pedestrian is killed every two hours in the USA. Here in New Jersey, about 150 pedestrians die on our roads every year. Although advocates of bear-hunting protest about the threat of bears in New Jersey, nobody has ever been killed by a bear here. 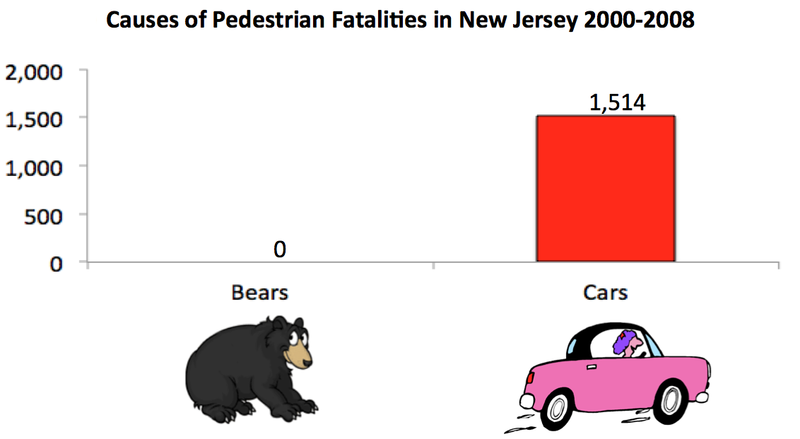 Instead of stressing about bears, we would do far better to make life safer for pedestrians. Both Princetons and Mercer County adopted ‘Complete Streets‘ policies in 2012, but many roads, including major thoroughfares like Hwy 27 towards Kingston don’t even have sidewalks. Many crosswalks are poorly lit at night and speeding is epidemic. Our zoning laws are heavily biased toward low-density housing, with the result that tens of thousands of people drive into Princeton every day, greatly adding to traffic and endangering pedestrians. The ‘Packet’ could take a stand about any of these real issues, but instead it calls for action on bears, which are already followed around by Princeton police with a dedication that would make Ranger Smith proud. The worst aspect of worrying about bears is that it adds to the stress levels of parents who naturally want to protect their kids. “Why take chances?” asks the Packet editorial, and many parents agree with this logic. There are lots of threats on the street, whether bears, or cars, or dangerous dogs, or who knows what else. Surely the right thing to do is to drive the kids to school? Much safer, right? Well, no. A decline in kids walking to school has been matched with a very real increase in poor health in the younger generation. In 1969, 49% of kids walked or biked to school, compared to just 13% of kids today. 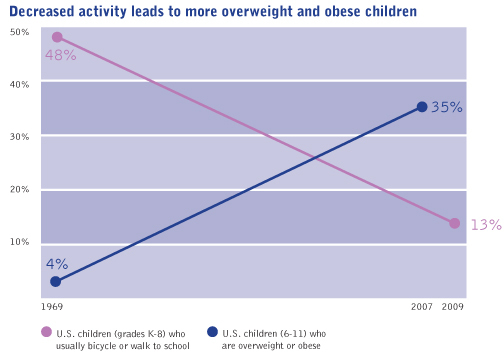 In the same period, the proportion of kids who are overweight or obese has rocketed from 4% to 35%. More than one in three kids now has a weight problem. The biggest risk for kids walking to school is that their parents will get worried about statistically-unlikely dangers and drive them to school instead. This denies kids the opportunity to get essential exercise and reinforces at an early age the idea that cars are the only legitimate way to get around. Parents are busy with 6 million things, and it’s often easier to put the kids in the car than arrange all the things necessary to get them walking or biking themselves. Kids don’t help either, often resisting walking because of the weather/their sore feet/feeling tired etc. But walking to school has been linked with better physical and psychological wellbeing, and improved academic performance. It staves off obesity, which is considered the number 1 health problem in the US, and which contributes to heart disease, the number one killer of Americans. Letting kids walk to school is a great way for them to get exercise, but the benefits don’t stop there. They get to socialize with their friends, and, importantly, build independence by learning to recognize and deal with threats that exist in real life. These threats include speeding cars, angry dogs, and the [very small] chance of encountering a bear. Learning to cope with these threats provides young people with a framework for dealing with other, more problematic issues that they will likely face as they get older. Next time you’re at your school, consider asking about what programs exist to encourage walking and biking to school. Many schools participate in the ‘Safe Routes to Schools‘ program, which encourages active transportation. You could also consider setting up a ‘Walking School Bus‘, where a group of parents take it in turns to walk a group of children to school, stopping off along a ‘bus route’ of homes on the way to pick up or drop off students. Don’t forget to teach your kids to know what to do if they meet a bear along the way! If you think kids yelling at a bear won’t scare it off, then check out his picture of a black bear in West Milford, NJ, which was scared up a tree by a cat. Adults may fear bear encounters, but children are likely to find the possibility very exciting! What do you think? Do you think fear bears? Or are people getting the threat level out of proportion? Leave a comment below. This entry was posted in Princeton, Walking. Bookmark the permalink. 2 Responses to Are Bears Really A Threat To Princeton?